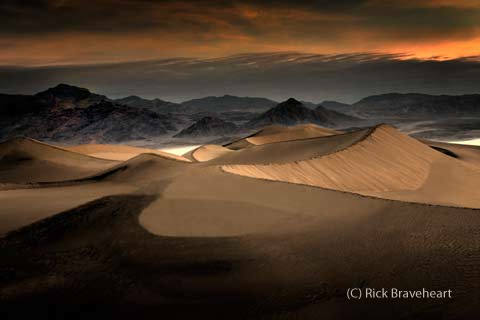 A few weeks ago I completed my work at Death Valley National Park in California and am now back in my Ohio studio. I returned home with fond memories, a broken camera lens, and several dozen black and white photos that will need to be developed and printed in the darkroom. books and maps about the park, its history and its geology. And now, after my experience there, here is a list of the resources that I found most helpful and which I can highly recommend in case you plan to visit. Best Overall Book: I discovered this book just before leaving for the park and wish I had known about it even sooner. Of the many travel books that I read about Death Valley, this was the most helpful and informative of them all. It covers an extensive variety of topics about the park, its Native American history and history of prospectors and miners, information on its plants and wildlife and detailed descriptions on most sections of the park including maps showing point to point distances. by Bill Cunningham & Polly Cunningham. Best Hiking Book: If you enjoy walking or hiking to experience the land and nature close-up, this is a great book to carry with you. The 112 page easy to read guide contains clear descriptions and well illustrated maps on twenty different easy/moderate hiking trails within the park. “Best Easy Day Hikes” is a great starting place for anyone interested in exploring more of the park than from what you can view from a car or designated park overlook. This newly published packaged set contains two books in one. The first is the excellent National Geographic Trails Map of the park (described below and which I highly recommend). Also included is a “Pocket Naturalist Guide” with indepth information about the plants found within this region of California. If you’ll be hiking, driving or exploring areas of California other than within the park this DeLorme Gazetteer is THE map resource to have. Printed on 11×15.5″ paper, it is an excellent resource for trip planning or for spur of the moment exploration. This atlas contains a whopping 160 pages of highly detailed maps with each map covering an area of roughly 30 by 45 miles (48-72 km). These maps identify major highways, roadways, rivers and streams as well as topographic features to help you navigate the terrain. I rely on these great atlases from DeLorme for all my photo assignments and can highly recommend them. Best History Book on the Park: Before arriving at any national park or forest I learn as much as possible about the history of the area, its people and about how/why the park was established. Knowing these things are important because they help me to understand features of the past geology, people, cultures and social/political conditions that aid me in looking more deeply at a park and inform my photography. Best Map: From many years spent hiking and photographing America’s national parks and its backcountry, I’ve always found the Trails Illustrated series from National Geographic to be the most detailed, helpful and informative maps available. Published on a tear-proof and resistant paper that can be folded and unfolded repeatedly, this full color 4×9″ (folded size) map unfolds to a very useful and easy to read 28×32″ size. In addition to roads and trails, the map identifies campsites and additional points of interest in and around the park. Photograph America Newsletter is the best photo-location resource guide around. Bob Hitchman has written this 12-page newsletter four times a year since 1989. Each issue includes great suggestions on photo locations, driving/hiking tips and beautiful photographs of the area. I’ve relied on Bob’s newsletters for years to help plan a trip before I arrive and highly recommend it to photographers and tourists alike. Click here to visit the Photograph America website and Bob’s issue on this park. During my time at Death Valley National Park there were a great many locations which I found lovely, breathtaking, inspirational and/or physically challenging to visit (in a good way!). My most memorable of them all, and for me, the most beautiful, inspirational and photogenic were the sand dunes. There are four designated sand dunes located throughout the park: Eureka Dunes (in the north), Panamint Dunes (in the west), Ibex Dunes (in the south) and my most favorite, Mesquite Flat Dunes located in the center of the park. 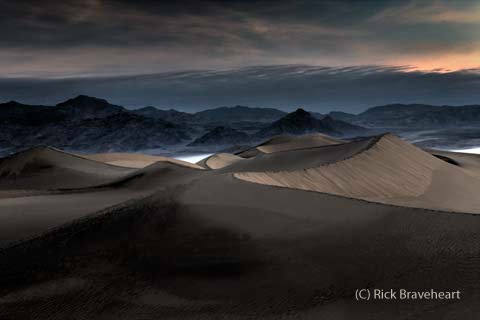 The most popular and most photographed destination in the park, and deservedly so, are the Mesquite Flat Sand Dunes. Located only 1 mile (1.6 km) down the road from Stovepipe Wells Village (with its motel, restaurant and RV/camping facility), it is also one of the easiest locations to visit in the park. And because of this, it can frequently be the busiest. Because of this, if you like solitude or having the place almost completely to yourself for photography, the best time to visit is very early or late in the day or at night. The Mesquite Flat Dunes within the park are frequently written about in travel books and became even more popular when they were used for filming many of the scenes in the Star Wars movies. Because of their publicity, most visitors to these dunes are usually surprised that the main section spans a small area of roughly two square miles (5.2km2). These dunes are located in the middle of a valley surrounded by mountains in all directions. Because of this they are relatively stationary, stable and have remained in this same location for over millions of years. They are also somewhat short. 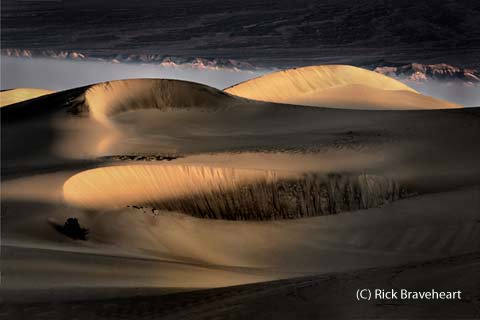 Compared to the massive dunes of the Arabian Peninsula, Moracco, Libya and France, the tallest at Mesquite Flat Dunes rise only about 100 feet (30.5m). While late day photography can produce pleasing results, because of the direction of the rising sun I found that the best time to photograph the dunes was around the time of sunrise. The soft morning light results in warmer colors and casts long shadows that can reveal even small details in the landscape. The second best time to photograph was late in the day but because the sun drops behind a distant mountain long before sunset, the window for good photography is brief. 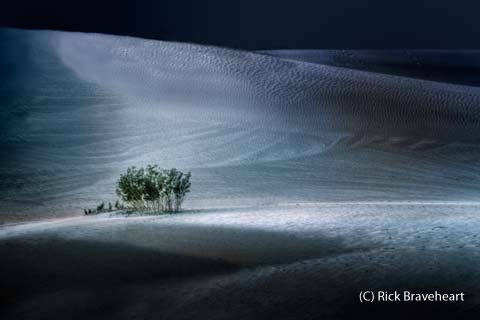 The light during mid-day in the dunes is far to bright for good photography and results in images that look flat and washed out. Similarly, because the dunes are so popular with daytime visitors, it’s nearly impossible to find an area that is not dotted with people nor one covered in footprints. Because of the frequently clear and dark skies nighttime and moon light photography also works well here. 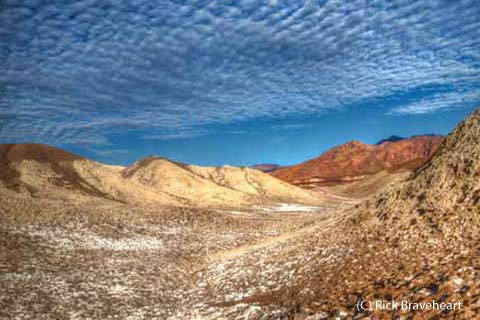 The area of the park known as Furnace Creek (mentioned in the last post) makes an excellent home base for visiting many of the park’s more popular destinations. It also includes several lodging facilities, four restaurants and houses the park’s Visitor Center. 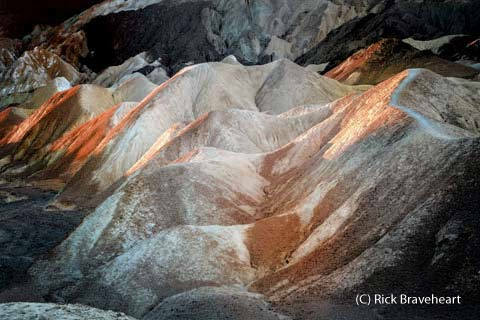 Two nearby locations that make for great photography, and each less than a ten minute drive from Furnace Creek, include Artist Palette and Twenty Mule Team Canyon. Artist Drive is a nine-mile (14.5 km) long, one way road into a canyon filled with vibrantly colored volcanic and sedimentary rock. Because of the height and position of the surrounding cliffs, afternoon photography works best here. Along the early part of the drive there are striking cliffs, bluffs and hills. At about the half-way point on the road is a parking lot that leads to one of the most popular sights in the park called Artist’s Palette. And, it is appropriately named because of its vibrantly colored rocks, many in green, gold and pink created from mineral deposits in volcanos that erupted millions of years ago. There are many locations on or near the parking lot where it’s easy to photograph Artists Palette. After several visits here I found a trail that leads from the parking area into the nearby canyon which offered even easier access to the rocks and better perspectives for photographing. At the end of Artist’s Drive where it joins the main road is a small hill topped with large volcanic rocks which can make interesting foreground subjects to include in photos of the valley and distant mountain ranges. 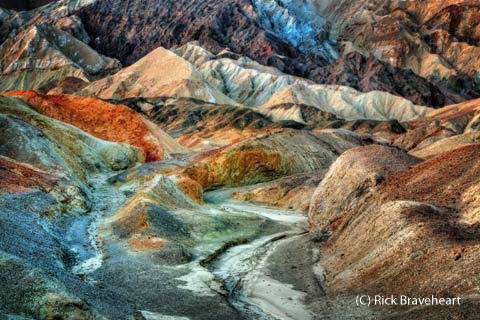 Another short drive from Furnace Creek is an area called Twenty Mule Team Canyon. 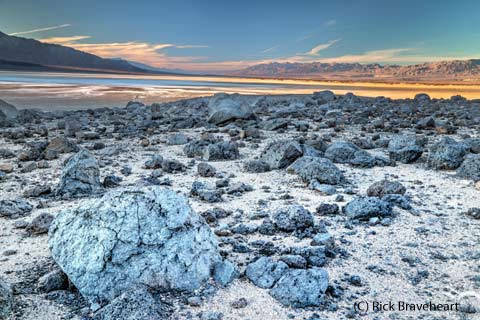 In the late 1880’s and long before death valley was a national park, this area was (and still is today) the site of numerous borax mines. Borax is a white mineral used as an antiseptic and in the making of glass and ceramics. When ground into fine crystals, borax dissolves easily in water is widely used in soaps and laundry detergents. Twenty Mule Team Canyon is an unpaved, one-way road roughly 2.5 miles (4 km) long that leads through a canyon of gracefully shaped multicolored badlands. While the road can be driven with a standard automobile it includes some twists and turns that need to be navigated slowly and with caution. The drive takes you over gentle hills and through gullies and sandy washes. Along the way are several parking areas where you can leave your car and hike to view the effects of wind/rain erosion on rocks and encounter the sites of old borax mines.